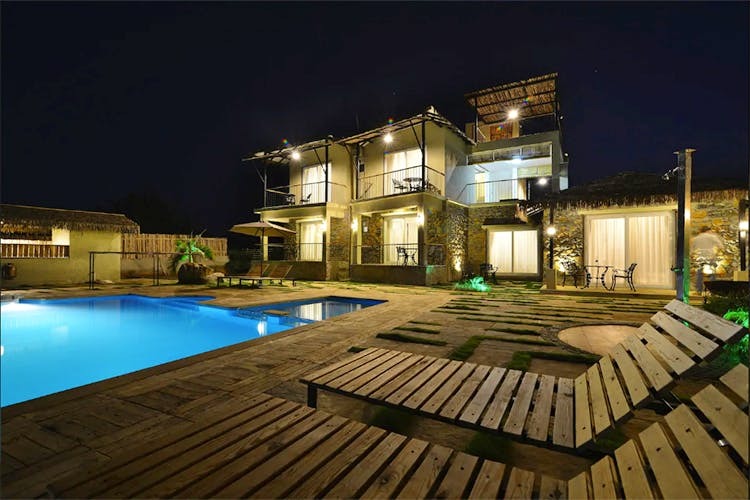 The Sommelier's Villa is a lovely, large property that sits just outside of Nashik. It has enough space to sleep around 12 people (max 20) - which we think makes it ideal for a group getaway to Maharashtra's wine country! We think this property has a lot to offer - whether you're here to tour the vineyards, just for a weekend getaway, or a special occasion. Sommelier's Villa is located in the countryside just on the outskirts of Nashik - and should take you no longer than 5.5 hours to get here via road. It's close enough to the city centre (about 40 mins drive) should you need anything, but also far enough for you to enjoy the peace and quiet of Nashik's countryside. We love that the villa is designed for a group of people and that it has plenty of recreational activities and facilities to keep everyone entertained. Sommelier's Villa have simple but stylish interiors - a bit of a contemporary-rustic aesthetic that appears as welcoming and homely.One of the bedrooms is even outfitted with 3 bunk beds - which we think would be perfect for a pyjama party with your besties! The large living room on the ground floor opens onto their wood-deck poolside patio. Take a relaxing dip in their large pool, or fix yourself a drink in the poolside cabana! Deck chairs are on-hand in case you'd like to sit back and chill. The pool deck is also ideal for an outdoor BBQ night (which can be arranged for on prior request), and the sprawling well-manicured lawn looks apt for stargazing. A free bonfire can also be arranged for; weather permitting. There's no need to venture out for meals - breakfast is complimentary, and additional meals can be arranged for with the trained in-house staff. In case you're feeling fancy, they have a private Chef you can hire at an additional charge, too. There's a private indoor bar which you can stock with your own alcohol, or arrange for the same via the villa's caretaker (on prior notice). Games like chess, Taboo, Pictionary, Monopoly, Uno, cards etc. are also at your disposal; and there's an outdoor swing-set for children. Don't forget to carry popcorn with you - the villa also has a private mini-theatre with plush recliner chairs, so you can enjoy your favourite movies on the big screen in absolute comfort. Fitness buffs can make use of the well-equipped gym at the villa as well.